Our area offers plenty of opportunities for walking, running and off-road cycling. We start mentioning few of ideas with the will to add many more in the coming future. Please suggest your own preferred run/walks/rides. 6 (Bridleway) – From Millers Lane (Old Kennels Lane Corner) to Hurdle Way along the western edge of the Yew Hill Butterfly Area. 7 (Footpath) – from the bridge over Badger Farm Road along the Texas Drive Fields to Millers Lane. 9 (Bridleway) – from the Recreation Ground across the Texas Drive Fields and then along the Eastern edge of the Yew Hill Butterfly Area. 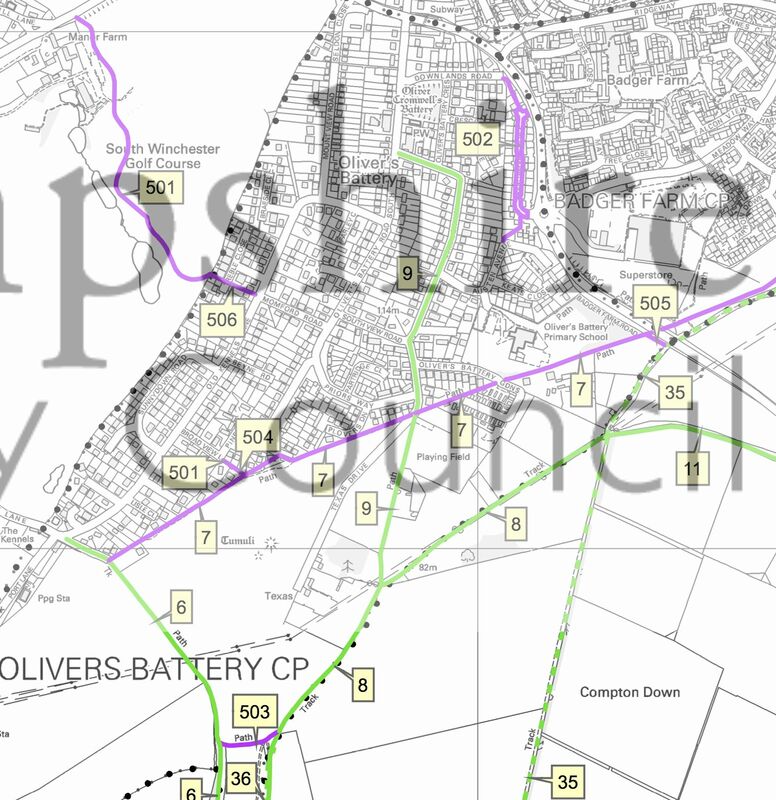 Below you can find a detail of the definitive map of public rights of way 2010 (Hampshire County Council). By clicking on the picture you can get the relevant pdf document including the footpaths. Once a month Cllr Fab de Liberali is walking our footpaths and outdoor to review and audit anything that might need intervention. You are welcome to join to discuss options and solutions. Please contact Fab de Liberali if you are interested to join.